The use of therapeutic pets has become increasingly popular over the years, and for good reason. While positive studies are rare, those that have been done have shown that owning and being around an animal can have calming effects on both adults and children with various disabilities. A new study from the University of Queensland, Australia has added to those positive studies after taking the time to investigate the effects of being near an animal on children with autism. Published in the journal PLOS ONE, the study analyzed the social and behavioral interactions of autistic children between the ages of five and thirteen. The children first interacted with both adults and normally developing peers while two guinea pigs were present. Toy guinea pigs were present during the second round of interactions. 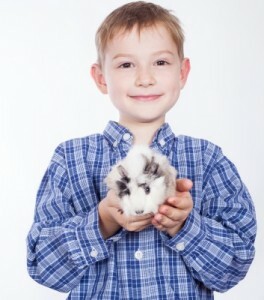 Results showed a number of improved social behaviors in ASD children when the live guinea pigs were in the room. When compared to behaviors and interactions when the toy guinea pigs were in the room, ASD children talked more, made more physical contact, looked at faces more frequently, and laughed and smiled more frequently when the live guinea pigs were present. Researchers found that they frowned, whined and cried less frequently when the live guinea pigs were in the room. While playing with toys, ASD children were also more likely to be receptive to advances from peers if the animals were in sight. This information coincides with former studies that have suggested people are more likely to receive friendly advances from strangers while walking a dog than when walking alone; studies on individuals with smaller animals, like turtles and rabbits, have produced comparable outcomes. When paired with their own study, it’s not difficult to see why researchers from the University of Queensland are suggesting that teachers, therapists, and other adults that work with autistic children consider the ‘social lubricant’ of animals crucial to the healing and development process. Probably the most notable situation in which this would be beneficial would be in the classroom, the authors said. However, even parents can reap the benefits of animal therapy for their children. Even if the animal isn’t the ‘typical’ therapeutic animal, parents can use pets to help calm their children and improve social interaction at home. We have a fish and a cat, and it’s just amazing to see how calmed my son becomes when the animals are within sight. In fact, we’ve witnessed him going from an aggressive outburst to calm after spending some time interacting with his fish. It’s such a simple thing, but for some reason, it really does seem to help.